German designer Simon Diener has designed a portable light that is suspended using its wrap-around cord and counterweight. The Pong light's battery, which is concealed in the cylindrical counterweight, can be recharged by USB. The light is designed to be easily upgraded if batteries get weaker, or better versions become available. Pong was shown at Milan design week and will be released later this year by German lighting brand Nyta. Portable lighting has become increasingly common at the furniture fair in recent years, with Philippe Starck telling Dezeen at the 2015 event that advances in lighting technology meant cables would gradually disappear. Pong similarly doesn't need to be plugged into an electrical socket to function, although its extra-long cord is a design feature, allowing it to be hung over beams or furniture. At the end of the cord is a dome-shaped shade made from aluminium and brass. 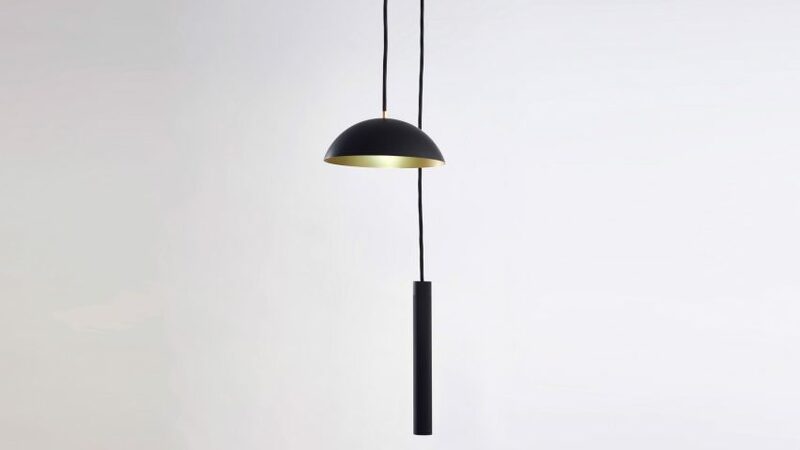 "Conventional pendant lamps must first be mounted and connected to a power grid before use," said Diener, who is studying Product Design at the Karlsruhe University of Art and Design. "I thought of evading these restrictions without losing the advantages of a traditional lamp, such as high-quality light." Earlier in the year, it was shortlisted for IMM Cologne's Pure Talents contest, which recognises the work of up-and-coming furniture and lighting designers. According to Diener, the light, which can also be used outdoors, is designed to encourage more interaction, and urge the owner to seek out new places in their homes. Nyta says its battery lasts anywhere between 10 to 20 hours. "The way people live today has changed tremendously," he told Dezeen. "Moving various times has become normal. Consequently, products need to adapt to a more mobile lifestyle." "Traditional furniture – like large, heavy wardrobes – become more and more obsolete, opening the door for new ideas." Other brands to have released portable lights include Marset, whose cordless lamp that can be carried from room to room, and Flos, which launched Starck's Unplugged design in 2015.